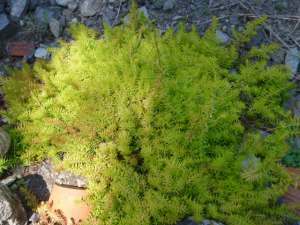 Sedum reflexum ‘Angelina’ is a justly popular Sedum, renowned for its gold and chartreuse spikey foliage. At times throughout the year, it will even change to a bronzy colour. Height: 6cm 3" flowers around 20cm 8"
Grown in a border situation, it’s well behaved and plays well with others, and contributes well to many colour schemes. Combined with blue foliaged plants, or in a pink and gold flowered mixed planter or Sedum tapestry, you’ll love this plant for its all round flattery of other textures and colours. Some of my favorite planting combinations are Sedum ‘Angelina’ with Sedum reflexum ‘Blue Spruce’, and the plain green form of Sedum reflexum. The addition of some of the species Jovibarba, or Sempervivum round out the spikey textures.